Paste preparation kettle is a semi-hemispherical jacketed bowl having two shaft extensions exactly opposite, which are fixed in Plummer block bearings. 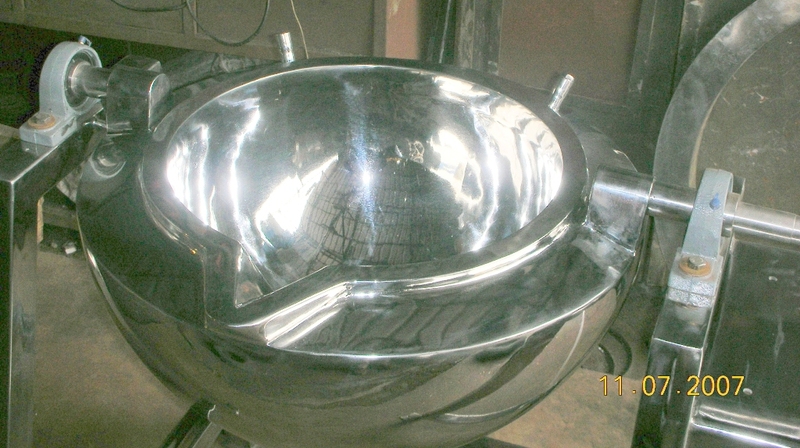 This jacketed bowl has connection for steam inlet/drain & also for steam pressure. 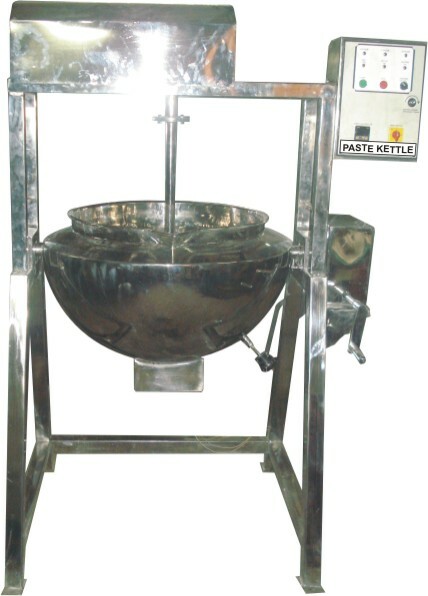 When electric heating is to be used this jacket is filled with oil & that is heated by electric heater dipped inside the jacket.Depending upon the user requirement, paste preparation kettle has anchor or stirring. On the shaft extension of paste kettle, there is a worm & worm wheel which is turned rotation for the paste kettle when someone wants to empty the kettle.Water is put inside the paste kettle bowl for heating & after it gets heated, starch or other binders are added to make a binder or paste. This paste is to be then used for wet granulation process in equipments like high shear mixers (RMG) or in Fluid bed granulators. 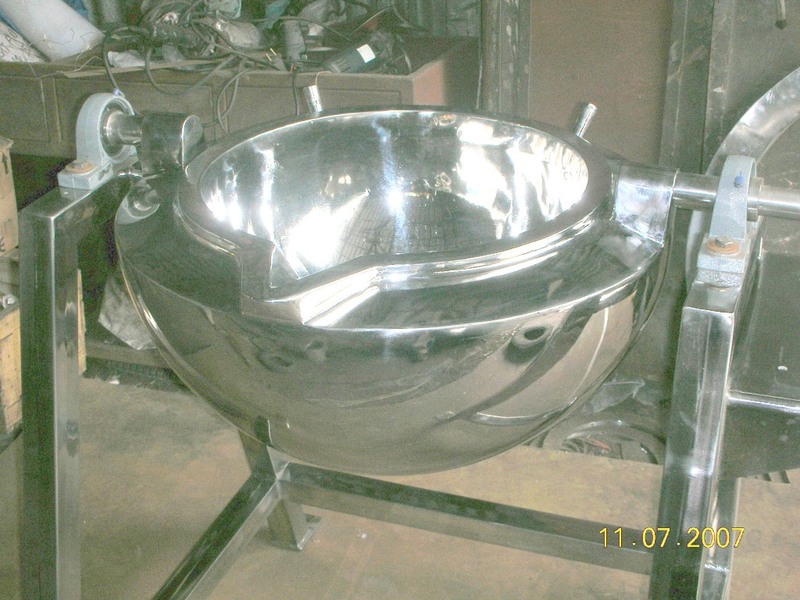 • Entire construction in S.S.
• Semi hemispherical bowl ensure that entire bowl can be emptied by rotating the worm wheel. • Simplified construction enables ease of operation. • Steam or electric heating is possible depending upon the user requirement. • when used with stirrer / anchor the movement of anchor is forward & reserve using cyclic timer. Stirrer can be supplied at additional cost. • When supplied with stirrer, there is a top entry drive without using any 'V' belt. Stirrer can also be removed for cleaning. Working Capacity :- 120 Ltrs. Electrical Service :- 415 v/3 PH/A.C. Supply. M.O.C. :- SS 316Q for Contact Parts. Control Panel :- Push Button to on/of M/C, R.Y.B. Lights for Phase indication, Contactor, on/off Rotary Switch, & Limit Switch. Net Weight :- 175 Kgs. Approx.